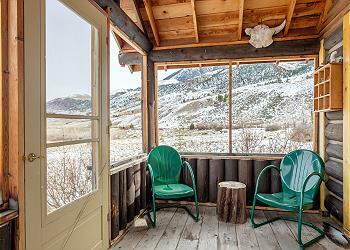 Charming, rustic cabins on the edge of the rugged Absaroka Mountain Range. Minutes from unbelievable fly fishing on mountain streams, spring creeks, and the Yellowstone River. Cabin has satellite TV and satellite Internet. 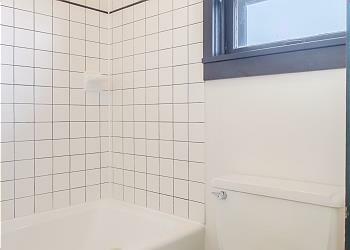 Two bedrooms and one bath in the main cabin, and two bedrooms with two full baths in the guest cottage. The main cabin (about 1000 square feet), will accommodate up to four guests. 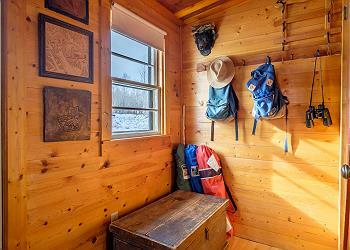 Rental of the guest cabin (about 600 square feet), allows up to four more guests. BRIEF DESCRIPTION: These two renovated cabins boast a beautiful and secluded location at the edge of the Paradise Valley. On twenty private acres at the end of a dirt road, views of the valley and the rugged Absaroka Mountain peaks are nearly all that can be seen. Wildlife and bird viewing, as well as access to millions of acres of public lands, makes it a nature enthusiast's dream. In spring and early summer, nearby Six Mile Creek can be heard rushing down from the mountains. GENERAL LOCATION: Twenty minutes south of Livingston, near Pray, Montana. Yellowstone National Park is only 30 miles away! 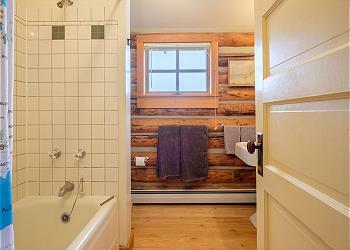 STYLE AND DECOR: Both of these cabins were moved from other sites and renovated in a comfortable, rustic style. The main cabin has a large front porch from which to enjoy the views. The second cabin (rented only in addition to the main cabin so as to protect guest's privacy), allows for larger groups to enjoy this wonderful home site. Both cabins have hardwood floors throughout and lots of windows. SIZE OF THE HOME: The main cabin is approximately 1000 square feet, and the second cabin is an additional 600 square feet. BEDROOMS/BATHROOMS: There is a total of four bedrooms and three bathrooms between the two cabins. The main cabin has one bedroom with a queen size bed, a sunroom with a double bed, and there is a sleeper sofa in the living room. The main cabin has one full bath. The guest cabin (affectionately called Mountain View Motel as it was, in fact, a motel cabin moved from Gardiner, Montana! 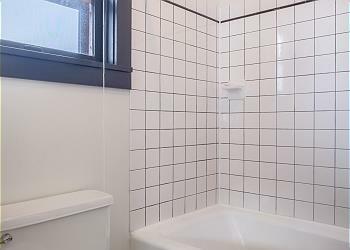 ), has two bedrooms each with one double bed and two baths. KITCHEN: The kitchen, dining and living areas of the main cabin are one big room, which gives the cabin a very homey feel. The kitchen is equipped with an electric range and oven, refrigerator, microwave, and all the necessary cookware needed. The kitchen table seats six comfortably. There is extra seating at the kitchen counter for a few more people. There is a gas grill for those outdoor meals. LIVING ROOM: The living room adjoins the kitchen and dining area. 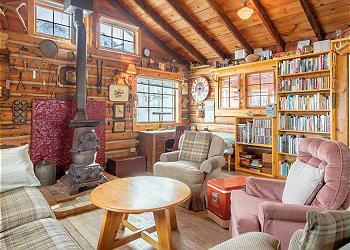 Comfortable furniture is situated around the woodstove providing a nice space for end-of-the-day relaxing. There is a television with satellite TV and a VCR, Satellite Internet, plus a radio with a CD and tape player. As with many of our homes, due to the home's location internet can not be guaranteed for downloading and streaming. DISTANCE TO NEAREST AIRPORT: The Gallatin Field airport, located just outside of Bozeman, is approximately an hour away. ACTIVITIES NEARBY: Enjoy fine hiking, mountain biking, fishing, horseback riding, whitewater rafting and all that the Paradise Valley has to offer. A day trip to Yellowstone National Park is a definite must! Just a short drive away is Dailey Lake - fun for fishing, swimming and a hot spot for local windsurfers, as well as Chico Hot Springs. And, if you don't want to get in the car, you can take a day hike right out the back door of the cabins. There's so much to do! We have stayed at Absaroka cabin several times and feel as though we are returning home each time. 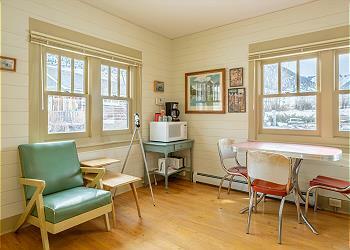 The home is cozy and well appointed and situated beneath Emigrant Peak in the spectacular Paradise Valley. Wildlife frequent the property, including deer, rabbits and many birds. We enjoy hiking in the National forests and Yellowstone and the cabin gives us convenient access to it all. We look forward to returning again soon. Our 8th stay at the cabin! We discovered this cabin 8 years ago and have never been disappointed from our first visit to the one this year! 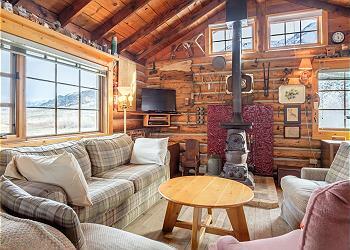 We absolutely love the cabin and the location and think of it as home away from home! The view of Emigrant Peak is unbeatable! We love to hike up behind the cabin and enjoy the incredible views! The cabin is always equipped with all that we need. Mountain-Home is a pleasure to rent through, great customer service! We can't wait to return! Thank you so much for your wonderful review of the Absaroka Cabins and Mountain Home Vacation Rentals! We absolutely love having guests return year after year and we hope to see you this summer as well. The cabins are waiting! We really enjoyed our stay in this comfortable out the way place. Very clean, nicely equipped-even a dishwasher. It was a nice respite after our days in Yellowstone. We are very glad you enjoyed your stay at the Absaroka Cabins and had all you needed for a great vacation. We love to hear when our guests enjoy our properties and enjoy Montana! Thank you again and we hope to see you in the future! We very much enjoyed our stay. We were 3 generations and found accommodations really relaxing. Certainly off the beaten path, but a great respite after long days in Yellowstone. Although the driveway may seem to go forever, it is well worth the drive! The main house has a fully equipped kitchen with spices, condiments, coffee and more! Plenty of dishes for cooking of any kind. Laundry room, off kitchen, is perfectly out of the way. 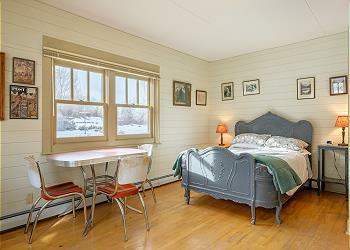 Charming decor and comfy clean blankets & linens. More than enough towels for everyone! Second house is perfect for allowing everyone their own space. The views from this hideaway are spectacular. Bunnies are waiting for when the sun wakes you. Stars and sky is breathtakingly beautiful. I have a camp of my own that I rent. After staying at your location, I now know I need to step it up a bit more. You have a fantastic place here! So glad you're willing to share! Thank you for having my Montana vacation stay be absolutely perfect! Thank you so very much for your glowing review of the Absaroka Cabins and Mountain Home Vacation Rentals! The goal of the homeowner and our office is to make sure the home is well equipped and comfortable for every guest. We love hearing from past guests that they thoroughly enjoyed the property and had everything they needed for a great vacation! We hope to see you another time! We stayed here for our first visit to Yellowstone, and it was perfect. The cabin was cozy and wonderfully stocked, and the bungalow was perfect for the children. Everyone absolutely loved it. We will definitely stay here again when we return! Thank you for your wonderful review of the Absaroka Cabins! We are very happy you enjoyed the home and had everything you needed during your stay. We would love to see your group again in the future! Thank you so much for your wonderful review of the Absaroka Cabins and Mountain Home Vacation Rentals! We are very happy your family enjoyed the property and was able to have a place to relax after long and exciting days in Yellowstone! Thank you again and we hope to have you as our guests in the future!